I don't know why, but above-ground urban power lines have always been a pet peeve of mine. I always notice how neighborhoods without them look nice and neighborhoods with lots of them don't. 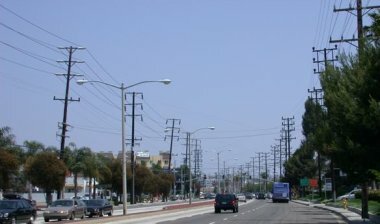 My neighborhood has many power lines running above the major streets and it looks ugly to me. I think the wealthier neighboorhoods in LA like Santa Monica and Beverly Hills have banded together and paid to underground theirs. The city is supposed to be widening Centinela Blvd. soon to cope with the increased traffic in the area (street widening is another pet peeve of mine, by the way, but that's another issue). I heard that they'll be adding a lane on the east side of the street in the section south of Washington Blvd. running to just south of Short Ave. There are power lines running along Centinela over the sidewalk that they will be moving to accomodate the new lane. Guess what? Intead of undergrounding them as part of the construction, they're just going to move them to the new sidewalk. Bummer. The picture shown above is of Lincoln Blvd. just a few miles from my house. I think I must disagree.. I like above ground power lines. I think that it adds to the character of a place. Without the lines I think it looks a bit sterile. Too many power lines is a bit yucky though. San Francisco has all the lines for power plus the bus lines, and that gets a bit overwhelming to me, even claustrophobic. Wow, I never thought anyone would say they liked the above ground power lines. I can see how the ones in San Francisco add character since they are there for the trolleys. Well next time I'm down about all the power lines around me, I'll think of what you said and be grateful for the character they add to my neighborhood.